John’s .32 Marlin Trio (top to bottom): .32-20, .32 HR Magnum and his “one-off” .327 Federal conversion. Short-action leverguns were the high-capacity “assault rifles” of the frontier period. The .44 Rimfire and .44-40 lever actions were necessary equipment for the peace officer, outdoorsman, rancher and cowboy. However, change was in the air and it would not be long before lighter rifles would be needed. Both Winchester and Marlin chambered their little leverguns in .44-40 and added the slightly flatter shooting .38-40. For varmints, small game and general ranching or farming duty, the .32-20 was added. By the 1890s the little .32 was very popular in both sixguns and leverguns because the frontier had been essentially settled and the need for more powerful saddleguns was diminished. From what I’ve seen of pre-1898 lever actions on the used gun market, it’s easier to find a .32-20 than a .44-40. Even with those buckhorn sights, John got good 50-yard results with his Winchester .32-20. Both Winchester and Marlin dropped their .32-20 leverguns prior to World War II; the Winchester 1892 exited in 1941 and the Marlin even earlier in 1935. It would be more than 50 years before Marlin would reintroduce their 1894 in .32-20 as the 1894CL (Classic) in 1988. However, it was short-lived and dropped five years later. Thanks to Cowboy Action Shooting, the 1894CL came back. The modernized version of the old 1894 has a 20" barrel and a short magazine tube holding six rounds. The stock is the straight grip style, the action contains a hammer block safety, and like all Marlins, is easily scoped. The bottlenecked .32-20 has always been regarded as more difficult to reload than straight-walled cartridges. It also requires a bit of effort to find the most accurate loads. The key is experimentation and it’s well worth the trouble to find a good shooting load. The .32-20 is capable of excellent accuracy once the right load is discovered. Speer 85 and 100-gr. JHPs are excellent choices for .32 leverguns. In the past there has been a greater variation in the length of factory .32-20 brass than in any other comparable cartridge in my experience. I’ve settled on Starline’s excellent .32-20 brass, which is both uniform in length and seems to be much tougher than other brands. Jacketed bullets are a natural in the Marlin 1894CL with three now available from Speer for the .32-20. These are JHPs with a diameter of 0.312" in weights of 85, 100 and 115 grains. The latter Gold Dot Hollow Point is my favorite for the .32-20 as well as the newer .327 Federal Magnum. John used cast bullets to print these 50-yard groups with his .32-20 Marlin. The Marlin handles heavier loads than the Winchester 92 and is easier to scope. Fifty-yard targets show John’s Marlin .32 H&R Magnum agrees with jacketed bullets! My Winchester M92 .32-20 is still completely original, including the 20" barrel. With the Speer 100-gr. GDHP over my two most used loads, it does everything and anything I can expect with the original factory iron sights. Using 5.0 grains of Unique gives me a very mild shooting 1,242 fps with three shots in 3/4" at 50 yards. My most-used load — 10.0 grains of #2400 — clocks out at 1,608 fps with three shots in 1-1/8". My serious cast bullet over the years for .32-20 sixgun or levergun is the old Lyman #311316. This flat-nosed, gas-checked bullet weighs just under 120 grains when sized and lubricated. When loaded over the same 10.0 grains of #2400, it clocks out at 1,627 fps and puts three shots in 1-3/4" at 50 yards. It does all this while being the slickest handling levergun ever made. My Marlin .32-20 is of more recent vintage and came originally with a 20" barrel and a half-length magazine tube. To make it better suited to my needs I had the barrel cut back to 18-1/2" and fitted with a full-length tube. I altered my Marlin top loads with the Speer 85 and 100-gr. bullets, measuring right at 2,300 and 2,000 fps respectively. The 100 has proven to be more accurate than the 85 and both loads are dynamite on varmints. My longtime favorite “heavy” load for the .32-20 is 10.0 grains of #2400 using Lyman’s 120-gr. gas check bullet. It works just as well in the Marlin as it does in the Winchester .32-20. This load also works fine with Speer’s 100 JHP clocking out at 1,760 fps and a group of only 7/8" for three shots at 50 yards. The Marlin 1894CL, with a little experimentation, exhibits exceptional accuracy with both cast and jacketed bullets. With the Speer 100-gr. JHP, loads average well under 1" for three shots at 50 yards with 10 grains H4227 and 9.0 grains AA#9 both giving identical muzzle velocities of 1,600 fps, not to mention three-shot, 50-yard groups of 1/2 and 3/8" respectively. Eleven grains H110 increases the muzzle velocity to 1,765 fps and a one-hole 1/4" group. My heaviest loads using 15.0 grains IMR4227 and CCI’s #400 Small Rifle Primers yields just over 2,000 fps and a group of 7/8" for three shots. I use this load only in the Marlin 1894CL. All of these tight Marlin groups were accomplished with a scope. While Winchester’s only .32 chambering in the Model 92 was the .32-20, Marlin has proven to be more versatile. As mentioned, Cowboy Action Shooting has had much to do with the resurrection of older cartridges. Fifty-yard targets shot with the Marlin converted to .327 Federal. At the SHOT Show I met with a Marlin representative and we discussed the possibility of a Marlin 1894 chambered in .32 H&R Magnum. This little cartridge had proven to be quite accurate in several sixguns and more than adequate for varmints at close range. I envisioned the lightest possible Marlin which would hold 10 rounds in the magazine tube, figuring this could be accomplished with a 16-1/2" round barrel. I did not get my first choice as Marlin decided to go with a heavier .32 than I had in mind, using a 20" octagon barrel. Although the result was heavier than I’d been looking for, it was and is an excellent rifle. Factory loads are necessarily held down because the .32 H&R Magnum was originally designed for Harrington & Richardson revolvers. The Marlin is capable of handling much heavier loads. I use both the Hornady and Speer 85-gr. JHPs loaded to 1,636 and 1,582 fps respectively, using 8.5 grains of #2400 and 8.5 grains of AA9. Both of these loads will shoot under 1" for nine shots at 25 yards with the factory iron sights. With .32 Magnum sixguns I mostly use cast bullets but with the longer barreled levergun I prefer mostly jacketed bullets for maximum velocity and less chance of leading. Oregon Trail’s 100-gr. hard-cast SWC loaded over 4.2 grains of Unique is right at 1,350 fps from the Marlin and shoots as accurately as the JHP loads. Long-established powders as #4227, #2400, and Unique all give excellent service in the .32 H&R Magnum, .327 Federal and these.32-20s. Originally designed in 2008 as a self-defense load, the .327 Federal Magnum is also an excellent varmint and small game cartridge. It was never chambered in any rifle to my knowledge. I talked with my gunsmith Tom at Buckhorn as to whether he thought the Marlin .32 Magnum could be rechambered to the longer .327 Magnum but the problem would be getting the longer cartridge to feed. Tom thought it could be done and asked me to let him study it a mite as I turned over my second .32 Magnum Marlin. It didn’t take him long to solve things. The .327 Federal feeds easily through the .32 Magnum Marlin action — the only hitch being extraction is sometimes not always positive. With the .327 Federal in the Marlin 1894 I can increase the muzzle velocity of the 85-gr. JHP loads by 400 fps over the same bullet in the .32 Magnum. Using the same 10.0 grains of #2400 of my .32-20 loads with the Speer 100 and 115-gr. GDHPs gives me muzzle velocities over 1,600 fps with the .327 Magnum in the Marlin while 12.5 grains of H110 ups the muzzle velocities to well over 1,700 fps and 11.5 grains of AA9 increases this to over 1,800 fps. For cast bullet loads I use two gas-checked designs, both weighing just under 120 grains. These are the RCBS #32-115 FNGC and the Lyman #311316GC. With 12.5 grains of H110 these two bullets clock out at 1,800 fps and group in 7/8" and 5/8" respectively for four shots at 45 yards. Even in .32 caliber, sixgun/saddlegun cartridge commonality is as good an idea as ever! 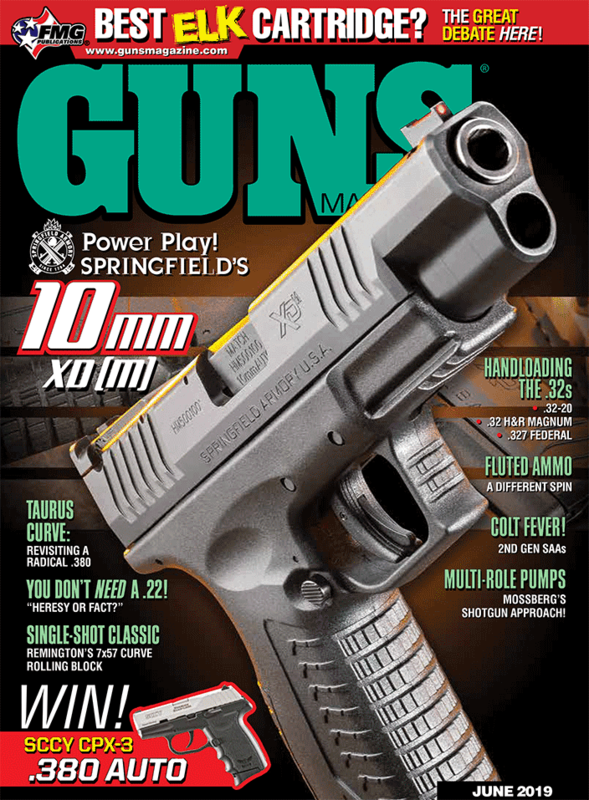 Purchase A PDF Download Of The GUNS Magazine June 2019 Issue Now!